FRENCH: Cipo Branco De Pernambuco, Kino, Raisin Marine, Raisinier, Raisinier Bord De Mer. SPANISH: Uva caleta, Uva de playa, Uvero, Uvero de playa. SURINAM: Droifi, Druif, Sistridroifi, Zeedruif. 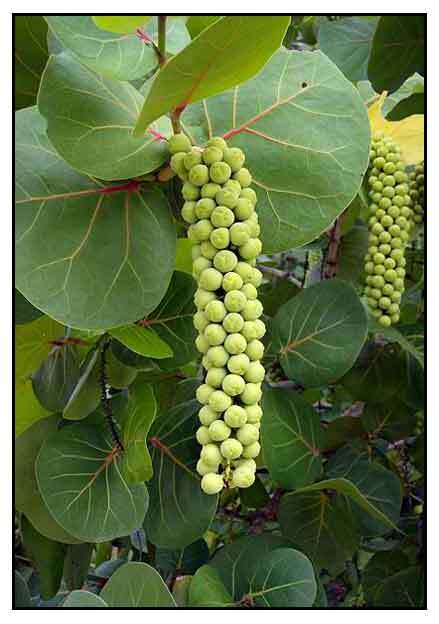 Sea grape is a sprawling bush or small tree, growing to a maximum height of 8 meters. Bark is smooth and yellowish. 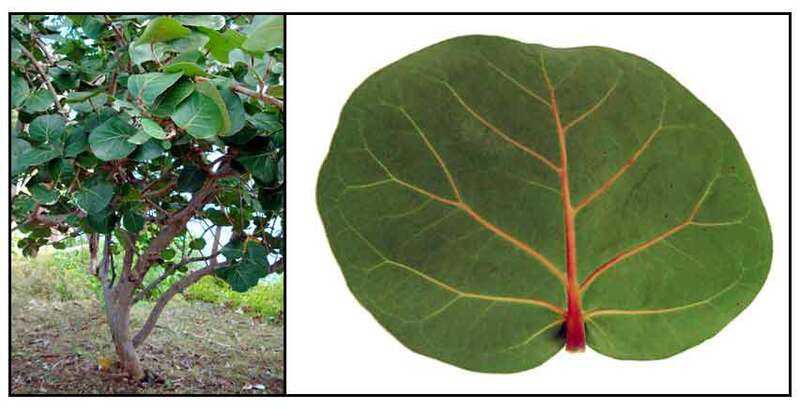 Leaves are alternate, short-petioled, large, leathery, glossy, dark green, broadly bean-shaped, with wavy margins, up to 15 centimeters long, with a reddish-colored primary vein extending from the base. Flowers are in terminal racemes, small, white and slightly fragrant, with five petals and eight stamens. Fruits are pear-shaped, reddish purple and green-dotted, 1.5 centimeters long, with a single hard seed, clustered in pendulous branches. - Salt tolerant, planted near beaches edges. - Ornamental distribution in parks and gardens. - Introduced to the Philippines in the 1940s. - In Hawaii, planted as a seashore windbreaker. - Native to the Florida, Bahamas, West Indies, South America and Mexico. - Methanolic extract of seeds yielded flavonoids, saponins, polyphenols, and tannins. - Bark of stem, branches, and roots are rich in tannins. - Studies suggest antibacterial, antifungal, photoprotective and glucose lowering properties. - Fruit is edible, eaten off the tree or made into jams, jellies and wine. - Flowers yield abundant nectar, the honey of good quality, light amber in color, and spicy. - No reported folkloric medicinal use in the Philippines. - In other countries, juice and decoction of wood, bark and roots are used to treat dysentery, hemorrhages, venereal disease. - Applied externally for rashes and skin afflictions. - Decoction of leaves used to treat asthma, hoarseness and to wash wounds. - Astringent roots and bark used in traditional medicine of Puerto Rico and the Caribbean. - Dye: Cut bark yields an astringent red sap, once used for tanning and dyeing. - Fuel: Wood is used for charcoal and firewood. - Furniture: Used in turning, inlay work, and cabinetry. 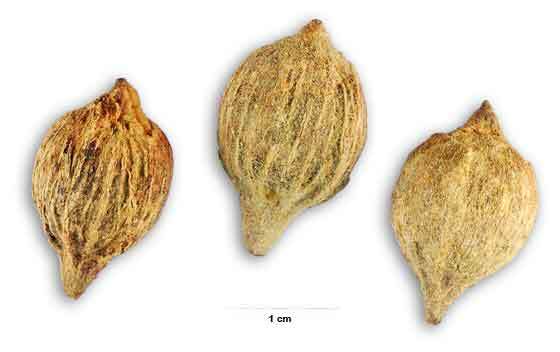 • Phytochemical: Studies show the chemical composition of Coccoloba uvifera as: α-Amyrin (antitumor, cytotoxic), chrysophanol (antiseptic, bactericidal, cathartic, hemostat, purgative), emodin (anti-aggregant, antiinflammatory, antitumor, antiulcer, immunosuppressive, viricide), physcion (antiseptic, cathartic, purgative), rhein (anticarcinomic, antitumor, fungicide), royleanone, beta-sitosterol (hypoglycemic, hypolipidemic, hypocholesterolemic, hepatoprotective). • Glucose Lowering: Case studies have shown glucose lowering effect with daily ingestion of tea brewed from Coccoloba uvifera leaves. There is concern for lowering the blood sugar too much, especially with concurrent use of pharmaceutical hypoglycemics. • Preparation of Leaf Extract: Preparation of leaf extract is done by immersing coccoloba uvifera leaves in water, heating the water to boiling for about 4 hours. This brewing time must be just enough to dissolve the compound from the leaves. The active compounds are resistant to the low gastric pH and high temperatures. • The preferred embodiment is a ratio of 4 green leaves to every 3.8 liters of water. • Alternatively, leaf extract can be done by drying the c. uvifera leaves and dehydrating the pulp into a tea. In a preferred embodiment, 15 cc of the tea is dissolved in 3.8 liters of water before ingestion. • Other forms of delivery may be through tablets, capsules, powders, seasoning. • Antibacterial / Antifungal / Phytochemicals: Study yielded flavonoids, saponins, polyphenols and tannins. Ethanolic and methanol extracts inhibited the growth of E coli and P aeruginosa and showed antifungal activity against C albicans, Fusarium oxysporum and F. decencellulare. - Seeds in the cybermarket. Godofredo U. Stuart Jr., M.D.